The XEI Evactron® ES decontamination system. “It just works™” - that is what XEI Scientific is saying about its new Evactron® ES De-Contaminator™ - designed for OEM integration on SEMs/FIBs. The ES model starts easily with patent pending “POP” plasma ignition process. 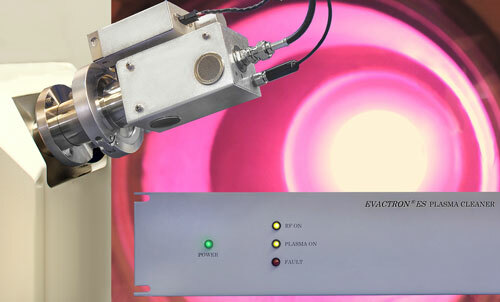 The simplified Evactron Plasma Radical Source (PRS) performs high efficiency cleaning in almost any high vacuum system. The ES performs the same “flowing afterglow™” cleaning that was introduced by XEI with its Evactron Zephyr™ models last year. It provides fast carbon cleaning rates of up to 150 Å/min @ 20cm from the plasma source when used with a turbo molecular pump. The ES model offers premium cleaning power at a low cost that allows it to be deployed on both low cost basic or premium SEMs,and FIBs. The ES is commanded by the microscope computer. A “Run” command starts plasma cleaning from the SEM and a “Stop” command ends it. The microscope interlocks close the electron gun valve during the cleaning cycle. It can be started from any vacuum pressure without evacuation system hassle. This allows the ES to be extremely simple to operate from the SEM software. Power level, cleaning time and the cleaning cycle are also controlled from the SEM computer. The Evactron ES has a 20 W @ 13.56 MHz RF power supply, microprocessor control with an external computer connection, fixed impedance match, Evactron® PRS with hollow cathode electrode, and 100 - 250 VAC 50/60 Hz input. It includes XEI’s standard five year factory warranty. XXEI Scientific Inc. invented the Evactron De-Contaminator in 1999 as the first plasma cleaner to use a downstream cleaning process to remove carbon from electron microscopes. A proprietary plasma source uses air to produce oxygen radicals for oxidation of carbon compounds for removal by the pumps. Carbon-free-vacuum produces the highest quality images and analytical results from SEMs and other vacuum analytical instruments. XEI innovations also include a unique RF plasma generator, a patented RF electrode, and easy start programmed plasma cleaning. All XEI products come with a 5 year warranty and are compliant with CE, NRTL, and Semi-S2 safety standards. XEI offers a variety of Evactron® decontamination systems to meet user needs and >1850 installations around the world.